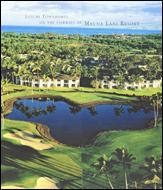 The Islands at Mauna Lani – 46 condominium townhouses spread over 20 acres of lush landscape – is centrally located within the world class Mauna Lani Resort on the sunny Kona Kohala Coast of the Big Island of Hawaii. This is the most private of Mauna Lani townhouse complex. Other complexes are 2 to 3 times more dense. Conveniently close to shops, restaurants, the beach, golf, tennis and racquet club, and the Mauna Lani Bay and Fairmont Orchid Hotels, this Hawaiian vacation townhouse offers the space, privacy and tranquility of a house away from home. 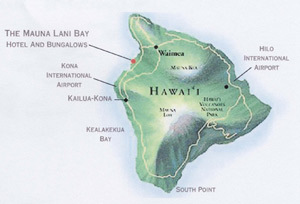 "One of the best guide books to the Big Island, "Hawaii The Big Island Revealed," described The Islands as follows: "This place is outstanding. The two-story townhouse-type units are posh with high-end furnishings (like Sub-Zero refrigerators), bathrooms large enough to taxi a small plane, bathtubs with bay windows, private garages, etc. 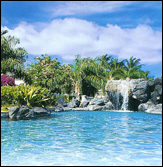 This very quiet and secluded gated property is located on the Mauna Lani North Golf Course. (Not oceanfront -- hey, you can't have it all.). . . . These condos are huge. 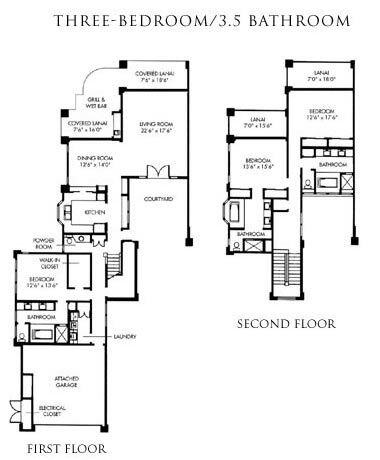 Two-bedroom units are 2,100 sq. ft, 2/3s are 2,550. The grounds are manicured, and the pool area, with its kitchen and dashing waterfall, is inviting. If you are looking for upscale privacy and your budget won't allow the $5,000 bungalows at the Mauna Lani (in other words, if you aren't filthy with it), this is a very nice alternative."